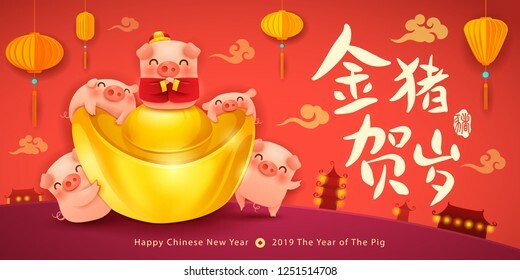 535 place | Vector illustration in rank M-rank: Five little pigs with chinese gold ingot. Greetings from the golden pig. Poster design. Translation : (title) Greetings from the golden pig. Five little pigs with chinese gold ingot. Greetings from the golden pig. Poster design. Translation : (title) Greetings from the golden pig.